What Do Critics Know? A lot actually. Now that we've established that, the musical of the same question by Matthew Gurren and James Campodonico is an homage to the classics. A musical for insiders, What Do Critics Know? is a comedy about three prominent critics trying to put on a Broadway musical. What Do Critics Know? is a low-fat musical. It has the appearance of a glitzy classic, it’s just missing everything that makes it full. The story follows Nathan, a constantly critically panned writer, who catches a big break when three prominent theater critics, inspired by some real life ones, are forced to put on a Broadway smash of their own. Set during Broadway’s Golden Age, What Do Critics Know? is like the offspring of The Producers and Curtains. The plot is cute. The script is filled with loving nods to theater and the famous people who make it. The musical comedy would have fit right at home in the time that inspired it. But as far as something fresh and new? What Do Critics Know? is anything but. The characters created by Matthew Gurren are cookie-cutter, and it works for this piece. They aren’t complex. They follow the basic musical comedy recipe. You have a simple leading man who just wants to win the girl, and save his career. You have the former flame who turned into the leading man’s opposition. You have the understudy who latches on to the leading man making the former flame jealous. And yet this love triangle still seemed contrived. It’s partially due to the timing of the love introductions. The first part of the first act is focused so much on the demise of Nathan and the plotline of the critics’ musical that it’s quite late that we learn that dancer turned critic Irma was Nathan’s ex. But hey, every musical comedy needs a love story. Some of the strongest characters Gurren fashioned happened to be the comic reliefs. Chester and Brad, the critics from the Times and Post respectively, are complete parodies of notable writers at both papers. And for that, they’re brilliant. Chester loves his long-winded rants while Brad just loves to gossip, and chorus boys. Because they’re so recognizable, it elevates the comedy. But that theory doesn’t quite work with the other pair of familiar names. Without spoiling too much, Chester, Brad, and Irma desperately seek out writers to write their show. What they get are Shakespeare and Bach. But not exactly them. They happen to be Ren Faire actors hired to take on the personas. Which leads to many comedic mishaps. Don’t get me wrong, they were audience favorites, but there was something so unfunny about this device that never ended. Overall, most of the plot mishaps occur during the messy second act. To match the fun, colorful classic style, the score by Gurren and James Campodonico rivals those of the Golden Age. Gurren and Campodonico give us tender ballads, show stopping production numbers, and tunes that will get stuck in your head. But unless you’re longing for this style of musical, the score is simply dated. To bring What Do Critics Know? to the stage, a company of well-rounded performers took command. As Nathan, Chris Gleim is the essence of classic Broadway. The musical style is clearly in Gleim’s wheelhouse. Gleim makes you nostalgic from the roles of yore. Mary Mossberg as Irma has such charm as the woman who gave up her dream. Mossberg's pure vocal, like Gleim, fits this score beautifully. Musical comedy requires actors who can sing and know how to be funny. Thankfully, Ryan Knowles and Prescott Seymour went above and beyond. As Chester and Brad respectively, Knowles and Seymour were the perfect comedic duo. They played off one another so well, you would think they had been doing it for years. You almost wish they weren’t upstaged by those buffoons Shakespeare und Bach. A musical like this needs a great chorus. And they got just that. Though they played many bit parts, Lindsay Bayer, Sean Bell, Kaitlyn Frank, and Danny Harris Kornfeld made the chorus equally as important. And deserve to be recoginized. What Do Critics Know? isn’t making history. It’s meant to entertain. When it comes to getting the audience to smile and have a great time, director Michael Bello did just that. Bello allowed his actors to create characters that were fun and larger-than-life, though the ladies were a bit reserved as a whole. Bello let the physical comedy to take shape naturally. But you can’t have a musical like this without thrilling choreography. Choreographer Justin Boccito made his small ensemble perform as it were tripled. Boccito made the small stage look like a mammoth Broadway house. Scenic designer Anne Sherer tapped into her creative side when it came to the road boxes. The boxes doubled as many scenic pieces but the execution of the stickers on the side were just a disappointment. It was so nice seeing classic show logos but whether it was glue or paint, the halo around each made it look schlocky. The period costumes by Christopher Vergara fit the time but it was a bit of a bummer to have them be so bland in color. A little more pop of color would have matched the style of the show. What Do Critics Know? brings the nostalgia factor. It reminds us all why we love musical theater. But in an age of desiring something fresh, What Do Critics Know? will soon be forgotten. This show is for the nostalgia seekers, and that’s about it. 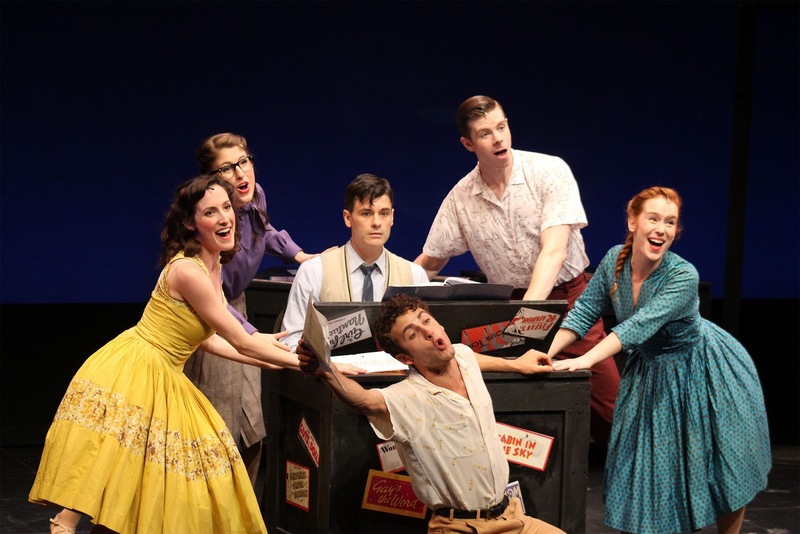 Labels: #musicalslivehere, Musicals Live Here, NYMF, Review, What Do Critics Know?